On April 9. 2011 the Village hosted the fourth Community Shredding Day. The new location in the fenced-in area behind Village Hall off Curtiss St., worked extremely well. Thanks to the many volunteers, there was ample staffing and hundreds of vehicles moved through the process very efficiently. 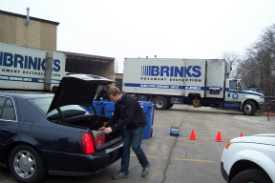 Two truckloads of documents were filled to capacity by Noon and disposed of by Brinks Document Destruction. The Village of Downers Grove, in partnership with Brinks Document Destruction, held a Paper-Shredding Event on Saturday, April 9, 2011 from 8:00 a.m. until Noon at Village Hall, 801 Burlington Ave. (Fenced-in lot off Curtiss St.--see map). This free service was offered to Downers Grove residents in an effort to prevent identity theft. Participants must show proof of Downers Grove residency. Each person was allowed to bring one brown paper bag or one banker's box filled with personal paperwork. A bonded and insured representative of Brinks Document Destruction used a crosscut shredder to render documents beyond reconstruction. Shredded materials were taken to a recycling facility. Identity theft is a serious crime. Thieves often look through unsuspecting victims' trash in search of discarded documents containing your name, address or phone number, as well other personal information such as Social Security, bank account or credit card numbers. People whose identities have been stolen can spend months or years trying to clear their names and restore their credit record. One of the most important things you can do is to shred any personal documents you wish to discard.